This photo accompanied my guardrail story last October 27. Almost a year ago, a question came up in the news about the end pieces on a particular brand of highway guardrails. Whatever happened on that point, I wondered this week. I asked ODOT, and promptly the answer came back. I wrote about this on Oct. 27, 2014. There had been a report on national TV that a certain type of guardrail “end terminal,” instead of pealing off to the side as intended, sometimes pierced the interior of vehicles that hit them head on. 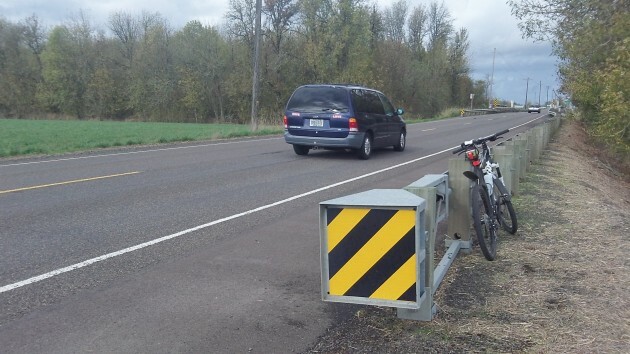 In Oregon, ODOT announced that 909 or 4 percent of the 22,539 guardrail terminals in Oregon were of the brand a newer version of which was involved in the controversy, and the department was awaiting more information before deciding whether to replace them. Last week, sadly, a crash report from the Oregon State Police reminded me of the guardrail story. On the afternoon of Sept. 5, a 2015 Chevy Tahoe hit a guardrail and then a tree on Highway 101 south of Gold Beach. The state police said a section of the guardrail “penetrated the passenger compartment and caused severe injuries to the driver,” a 68-year-old man from Ohio who was declared dead when he got to the hospital. The OSP didn’t say if it was the end piece or some other part of the guardrail that penetrated the vehicle, but it’s safe to assume that no part of any guardrails is meant to do that.